Teal (sometimes blue) in daylight and red in candlelight. Alexandrite is the rare color-change variety of chrysoberyl. It was discovered in Russia’s Ural Mountains in the 1830s. The name 'Alexandrite' comes from the gem being discovered on Prince Alexander II of Russia’s birthday. Miners were mining for emeralds. They found several gems that resembled emeralds and brought them back to their camp. When they looked at the gems at night by the campfire, they were a vibrant red. 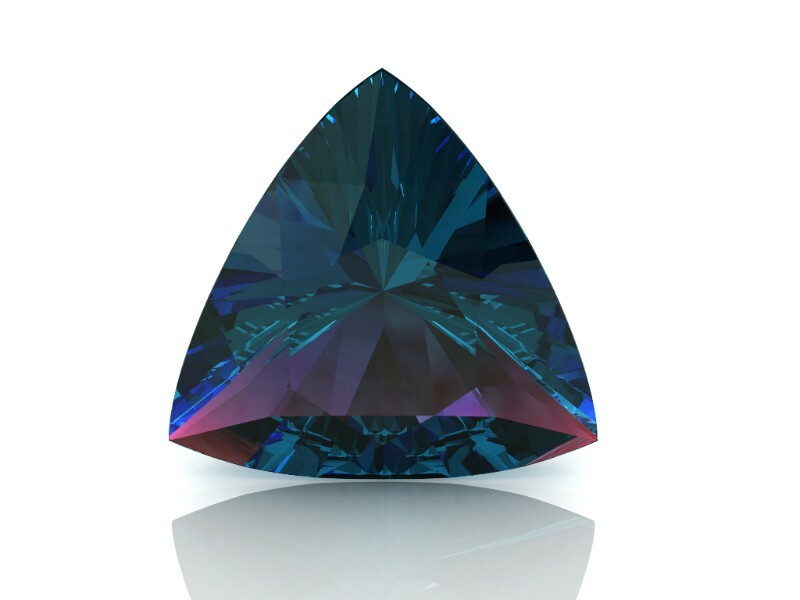 Nearly all of Russia’s Alexandrite was mined during the 19th Century. However, it was discovered in larger deposits in Ceylon (Sri Lanka), East Africa, and Brazil. Typically, the Russian Alexandrite color-change is green to purplish-red and Ceylon, Africa, and Brazil are teal and deep blue to red. (Africa has produced Alexandrite in various colors; however, by far the most coveted is the Russian green to purplish-red). It is a pleochroic gem, which means it shows different colors when viewed from different angles, but what makes this gem's color-change special is the mineral's unique light absorbing capabilities. Today many (only the best quality) Alexandrites from Brazil exhibit 100% color-change making them the most prized. Most Alexandrites are smaller in carat weight (less than 3 carats) because of their rarity. They are an 8.5 on the Mohs' scale making them excellent for everyday wear. Alexandrite is thought to bring luck and love. It is believed to strengthen creativity, intuition, and imagination. With its changing color, it is a reminder to the wearer that life is not only what it seems to be giving those hope who may be in despair. 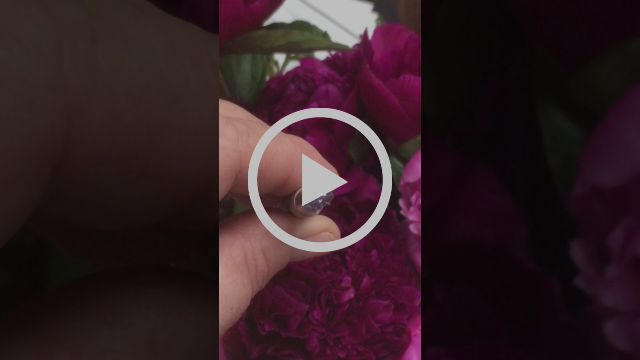 Alexandrite is the 55th wedding anniversary gift. Color: Change of color to pure green and red are higher in value. The more distinct the color-change, the more valuable. Clarity: Plays a significant role in grading. As is the case with a majority of gems, most naturally occurring Alexandrite has inclusions, but the "eye clean" are the best value. Cut: The larger the cut juxtaposed with strong color-change and eye clean clarity is the best. Rarity: The Russian variety is basically extinct. The Brazilian variety is known to have the best color change at 100%, although Ceylon and some African can also have strong color change, depending upon the amount of chromium in the gemstone. We recommend cleaning Alexandrite jewelry with warm water and Dawn dish soap. You can use a soft toothbrush as needed. Did you know that pearls are the only gem that is made by living creatures? Mollusks produce pearls by depositing layers of calcium carbonate around irritants in their shells. These irritants are microscopic and usually not a grain of sand. The name “pearl” comes from the Old French "perle" from the Latin perna meaning "leg" which refers to the shape of mollusk shell. The rarest, and thus most expensive pearls are those made in the wild. True natural pearls are very rare. Almost all the pearls sold today are farmed (cultured) by inserting an irritant (shell or round bead) into oysters or freshwater mussels. Note: Pearls are very soft, ranging between 2.5 and 4.5 on the Mohs' scale. Keep them away from high heat and acid (vinegar would dissolve a pearl). What to look for: The best pearls have a reflective luster that's white in appearance with an iridescent nacre of many colorful hues (known as peacock). Brazilian trillion 1.43 carat Alexandrite with 100% color-change, eye-clean. Hue is blue to red. Tone is medium dark and the saturation is strong. California Girl Jewelry has a full service jewelry boutique in Union Square, San Francisco. Our address is 833 Market St., Suite 621 and our hours are 11-5:00pm Monday - Wednesday; Thursday; 1:30-5:00pm Fridays 11-4pm; Saturday by appointment. Stop by to sip some champagne as you shop.